So I was stuck in this no-man’s-land of being pregnant – maybe – for two weeks while I waited for my obstetrician to officially confirm that a) my pregnancy tests weren’t liars and b) the embryo had a heartbeat. Normally the only people you’d tell that early are the girlfriends or family members you’d tell you miscarried. Like your mom. Except my mother was dead. My BFF, M, had already had five heartbreaking miscarriages of her own. I was too chicken to tell her I’d gotten pregnant easily. Of course she’d be happy for me. And yet…how would I feel if I’d wanted a baby for years and someone who’d been pretty ambivalent about having kids got pregnant right away? I’d be happy for my friend, but I’d also be bitter enough to flip off the universe. And maybe my fertile friend, too, while she was looking in the opposite direction. It’s kind of how I feel about writers who get their first book or screenplay published or sold immediately. Happy for them while also screaming “why not me? !” at a smirking universe. Only my husband Andy knew about my pregnancy. I didn’t feel sick and I don’t drink alcohol. No one suspected a thing. Six weeks after my last menstrual cycle, we visited the OB. It’s not like TV. Turns out, when the embryo is barely 4 weeks old, it’s hard to pick them up on a regular abdominal ultrasound. Enter the wand. Yes, the transvaginal wand, which goes exactly where you think. The transvaginal wand even gets covered in a condom and lubed up before insertion. Maybe someday it’ll vibrate, but until then, Mr. Wand feels about as good as you’d expect, which is to say, not good at all. But back to the exam room where a paper sheet covers my lower half and allows Andy, me, and the OB to pretend there’s no wand up my vaginal canal as we stare at the ultrasound monitor. “Relax,” the OB tells me, moving the wand. I glare at her, because never in the history of women being penetrated by a foreign object has ANY WOMAN EVER managed to relax just because the twerp initiating penetration simply suggested it. I settle for taking a deep breath and imagining shoving a wand in some of her bodily orifices. And maybe Andy’s too, since I know this is just the first of hundreds of poking and prodding indignities that I will endure while being pregnant. Apparently, I find images of violence relaxing. I file that away for the next appointment. Then I stare at the screen, willing an image to appear. It does. A tiny blob, smaller than a pinto bean, vibrates on the screen. At that age, the barely-an-embryo is nothing but a heartbeat, beating almost twice a second. It’s not as complex as an earthworm, let alone an ant. “That’s it?” Andy asks the OB. “Dodged that bullet,” Andy murmurs. “Seen enough?” asks the doctor. Andy, entranced by the vibrating bean on the screen, doesn’t answer. I tell the doctor yes, and breathe a sigh of relief when the wand withdraws. And eventually, there’d be a baby. I am sure this image is upside-down and equally sure my Judgmental Genius Doctor Sister will explain why. At some point. At length. Woo hoo! Now the ride really starts! Yeah and it’s one of those rides guaranteed to make you puke! It sounded like an uncomfortable experience. Have to agree that no woman likes to be prodded by a foreign object…it can take so long to get used to feeling something in you, and maybe you will never be accustomed to it. I really wonder where this is all going. Guessing it is not a straight happy dandy story. Exactly — and that wand ain’t no little tampon. I know! Since I had no idea how things would turn out, I am sharing that uncertainty with the reader. I’m nice like that. Maybe I’ll be like an elephant and gestation will take 2 years. I’ve had that “magic wand” too! But for a normal gynaecological revision, the first time I did one in China. The doctor suggested that this way you could see clearer inside the womb, or more things, or I don’t know what, so I agreed. It was not too bad, but I seem to have a weird condition that makes me super relaxed the moment I lie in a doctor’s office (the last time I had an electrocardiogram, the registered heart beat was of only 54/min and it scared the beejesus out of the doctor, hahaha). Wow, you find the doctor’s office soothing! That’s pretty impressive. 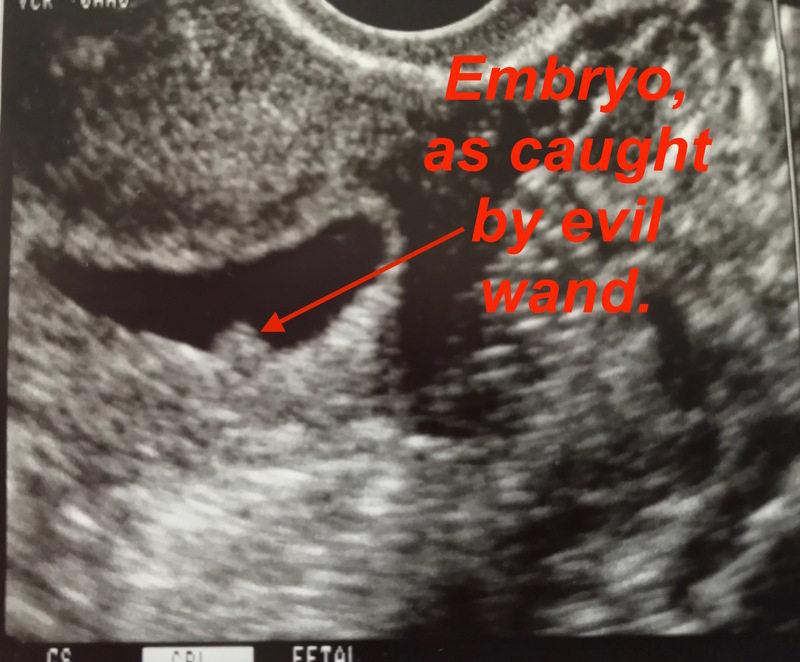 Interesting to know that they use that wand for more then embryo scouting. I still can’t believe I’ve been deprived of this news due to my own stupidity for the last month! LOL, not really, since it’s a memoir blog, you’ve actually been deprived of this news for years. And getting along just fine, right? But yeah, it’s potentially up there with other life-changing news. Oye, brings up memories of sorts. My cycle was irregular, therefore everyone thought I became pregnant in June instead of July. I remember going to ultrasound with baby donor and my mom, and drinking tons of water before the ultrasound. I don’t recall the transvaginal wand, although I think it was used. The woman who did them was cold and unprofessional ; she simply went through motions instead of explaining what we were seeing. We discovered that I was four or so weeks pregnant instead of eight, and we listened to my little ones heartbeat which sounded a bit like a frog. Prior to seeing my little one, I continued to be in disbelief that i had a baby inside of me. I admit that I was disappointed at the time to learn that my baby would have been born in March/April in a monkey year and an Aries. ( My dad is an aries, and I don’t get along with him) I often wished that my son would have been born in year of the goat and would have been a Capricorn when I was pregnant anyways, and yes I often wish that my son’s father would have been someone else and not the baby donor… My apologies for long comment. No apology necessary. I love comments, and yours is the first to share the ultrasound experience. I don’t really remember the sound, if there was one, just the throbbing image. And while I’m not a very superstitious person, I did wish for a Tiger or a Dragon — just cuz they seem so cool. I mean, who wouldn’t want to be a tiger or a dragon?! Wow! Very exciting. I like the way you make us feel that it’s all happening right now. It’s so hard to believe this story is all really past tense. My nine-year-old grandson was an IVF baby, so there was a terrific amount of technological interference in the pregnancy. But “back in the day” it was all so simple–no pregnancy sticks to pee on, no ultrasounds or transvaginal wands. It was all guess-work and surprises. “Surprise, it’s a girl.” We had a backup boy’s name for all three of our daughters; never had a chance to use. Yes, it’s hard to believe it’s all past tense when I’m using present tense, right? Which is rare for me, I usually gravitate to past tense. My mother had amniocenteses for her last two kids, mainly because she was pretty old by them. But one created all kind of complications. It’s nice that there are less invasive ways on checking on the fetus, though now I hear mutterings that ultrasound waves are stressing the baby. I dunno. Can’t possibly be as stressful as me yelling at the dogs, can it? Also–I love Andy’s response. Please don’t tell me he had a similar response during the ultrasound! I actually also had an early ultrasound, and was expecting it to be transvaginal, but then the doctor just used the wand on top of my belly. I didn’t complain though! And we still saw the heartbeat and stuff. Really? Maybe your doctor had better equipment. Ha, like men do whenever they see another guy take a shot to the balls (which they somehow also think is funny, men are weird).